Imagine waking up completely paralyzed. There is a strange pressure on your chest, you are having difficulty breathing, you are aware of your surroundings, and you are overwhelmed with dread because there is an evil presence in the room with you—the Intruder. Maybe it is whispering to you, maybe it is touching you. You cannot scream, and you cannot will yourself to move. You are experiencing the phenomenon known as sleep paralysis. Would you believe that there is a scientific explanation? Mythology has developed all around the world surrounding sleep paralysis, the most common explanation being that it occurs when there is a demon sitting on your chest. Researchers believe that sleep paralysis occurs when, essentially, your mind wakes up before your body does. As the body enters REM sleep, the brain paralyzes the body using two chemicals to prevent the sleeper from moving and acting out his or her dreams. But sometimes REM sleep is disturbed and the sleeper awakens while the body is still paralyzed. Sleep paralysis is sort of the opposite of sleepwalking, which occurs when the brain does not shut down movement properly during a dream. During sleep paralysis, movement is shut down and the dream just happens right in front of your eyes. While an episode of sleep paralysis is not dangerous, it can be absolutely terrifying. According to The Sleep Paralysis Project, there are nine conditions associated with sleep paralysis: being “awake,” realistic perception of environment, inability to move, overwhelming fear and dread, sensed presence, chest pressure, difficulty breathing, laying on the back, and “additional unusual sensations.” The first three are the only symptoms that are always present, and the rest may occur in varying degrees of severity. Erratic sleep patterns and certain sleep disorders increase the chance of having an episode of sleep paralysis. Some people will never experience it, some will a few times in their life, and some do on a weekly basis. The strangest part of sleep paralysis is its accompanying hallucinations. The brain often perceives that there is someone in the room, floating over you, pinning you down, or even sexually attacking you. In addition to visual hallucinations, common sensory experiences include sounds like “doors opening, animals growling, approaching footsteps, scratching, internal buzzing/beeping, [and] malevolent whispering, as well as smells of rotting flesh, ‘death,’ decay, damp, mold, and feelings of being moved, drifting, rolling, floating, cold, or heat.” Out of body experiences have also been reported. Crazy right? All you have to do is web search “sleep paralysis stories” to find countless unbelievable tales. I have experienced sleep paralysis twice, but I did not hallucinate. Both times I was sleep deprived, one time I was lying on my back, and the other I was sitting leaned against a wall. The first time, I woke up, couldn’t move, and felt a heavy pressure on my chest. Everything seemed to be buzzing and I was very warm. The second time, I had nodded off for a moment while sitting on my friend’s bed, and she was talking to me to try to get me to wake up. I could hear her but I couldn’t move. Neither time did I feel an evil presence or hallucinate, but I also knew that it was sleep paralysis and remained calm, focused on breathing, and tried to move my fingers. Some researchers believe that the feeling of dread and the hallucinations stem from the intense fear felt upon waking up paralyzed. Sleep paralysis is commonly associated with the belief in the incubus, and its female counterpart, the succubus—demons that sexually assault people in their sleep. Another link is to the British mythic figure of the Old Hag, who leaves her body at night to ride on victims’ chests. 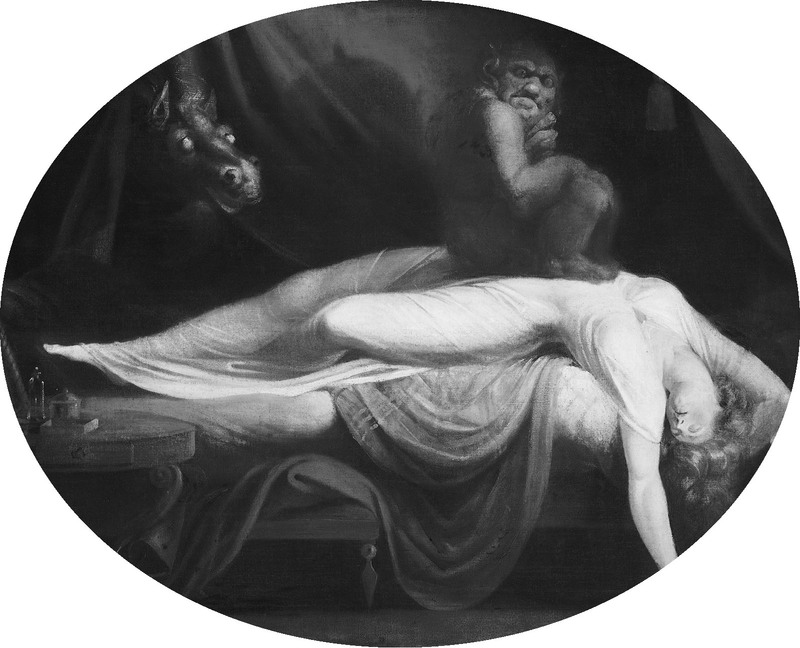 In German folklore, sleep paralysis is a spirit or goblin that rides on people’s chests while they are asleep, causing nightmares. Legend in Fiji describes sleep paralysis as being eaten by a demon, sometimes the spirit of a dead relative, who has returned for unfinished business. New Guinean mythology explains the phenomenon with sacred trees that feed on human essence, the sensation of sleep paralysis occurring when you wake up during the feeding. In Catalan legend, the Pesanta, a huge dog that puts its paws on people’s chests while they are sleeping, making it hard for them to breathe, causes the paralysis. Sleep paralysis is a very strange, shared human experience, and has produced words with similar meanings and similar folklore to explain it across cultures on every continent. In many languages, the word for sleep paralysis has to do with demons and ghosts pressing down on the body. To give just a few examples, the Korean term for sleep paralysis is gawi nulim, which means “being pressed down by a ghost.” Sleep paralysis is often called Ja-thoom in Arabic, which translates to “what sits heavily on something.” In the Finnish language, the word for nightmare, painajainen, is believed to have originally referred to sleep paralysis, because painaja translates to presser. According to Scientific American, “some people are certain that they have experienced such paranormal events” as “attacks by demons, ghostly visitations, and alien abductions,” when in reality, most of the experiences can probably be explained by sleep paralysis. There is not a fully satisfying answer as to why people see horrific figures during episodes of sleep paralysis. Could it be that sleep paralysis has given us our fear of monsters and ghosts and shaped our fairytales and mythology? Or is it the intense fear felt upon waking up that causes us to hallucinate, the still-dreaming brain seeing our worst fear right there in front of us? Reality Sandwich reports, “The apparitions associated with sleep paralysis include aliens, angels, and ancestors, depending on your cultural upbringing and your level of fear.” So you see what you’re afraid of. Carl Jung explains in his book, Flying Saucers, that reports of alien abductions can be explained by sleep paralysis—the lights, the noise, the feeling of whirling, the actual alien in plain sight—all explainable. The brain is simply projecting a nightmare, a co-creation between the sleeper’s expectations and unconscious mind, while in a confused state between being asleep and awake. So if you ever wake up and can’t move, don’t allow the fear to creep in, or your brain may start conjuring images of all of your deepest fears—and they will certainly feel real.